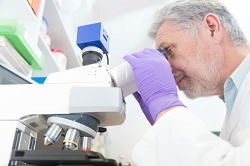 NICE has published diagnostics guidance recommending that everyone who is diagnosed with colorectal cancer should be tested for an inherited genetic condition called Lynch syndrome (LS). LS is the most common cause of hereditary bowel cancer and people with it also have an increased risk of developing other cancers including womb, ovarian and stomach. Testing for the condition helps to identify whether the patient’s family may also be at increased risk of cancer, meaning they could be monitored more closely if needed. The guidance recommends that microsatellite instability (MSI) testing or immunohistochemistry (IHC) should be used to detect abnormalities that might mean the presence of LS. Where these tests show the person has a risk of having LS the guidance recommends further tests are carried out to confirm the diagnosis. Because LS is an inherited condition, a positive test can lead to testing for family members. Diagnosing LS may also help with the choice of treatments for colorectal cancer; for example, to direct chemotherapy or surgery. LS accounts for approximately 3.3% (1 in 30) of colorectal tumours, and the condition is estimated to lead to over 1,100 colorectal cancers a year in the UK. NICE has also produced an adoption support tool that provides practical information and advice on implementing the guidance. To develop the tool NICE worked with five NHS organisations to share their learning and experiences of adopting molecular testing strategies.